One of the founders of the Canadian Jewish community; born early in the eighteenth century; died May 18, 1792. He settled in Montreal almost immediately after the British conquest. Before going to Canada he had lived in Albany, N. Y., where he retained interests, and occasionally resided, almost until the close of his life. He was largely engaged in traffic with the Indians, and his mercantile enterprises extended from Michilimackinac to the Gulf of St. Lawrence, and down the Hudson River. During the American invasion of Canada in 1775 General Montgomeryappointed Solomons purveyor to the American hospitals in Canada; and the defeat of Montgomery brought disaster to Solomons, who lost the large quantities of stores carried off by the retreating troops. The valuable assistance Solomons had given the Revolutionists subjected him to punishment by the Canadian government; General Burgoyne expelled him in July, 1776; his property was confiscated, and he was compelled to take refuge with his family in Lachine. Some time afterward he recovered some of his losses, and was permitted by the British government to return to Montreal. Through his efforts in 1788 a code of laws was drawn up for the government of the Sephardic synagogue of Montreal. 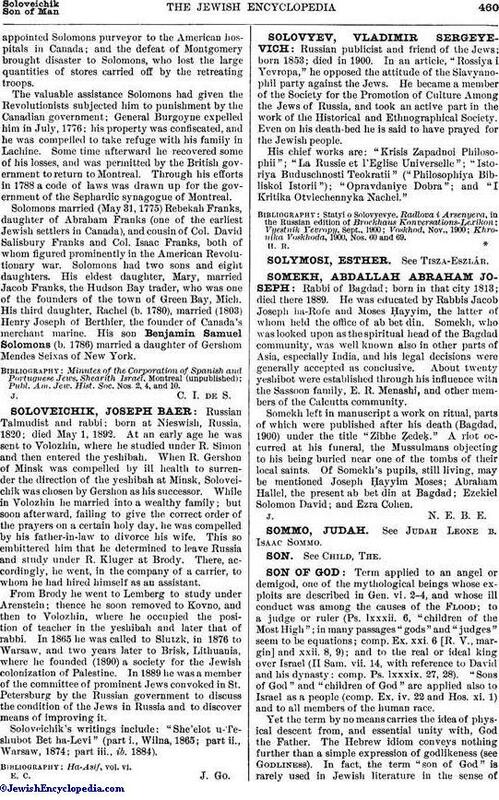 Solomons married (May 31, 1775) Rebekah Franks, daughter of Abraham Franks (one of the earliest Jewish settlers in Canada), and cousin of Col. David Salisbury Franks and Col. Isaac Franks, both of whom figured prominently in the American Revolutionary war. Solomons had two sons and eight daughters. His eldest daughter, Mary, married Jacob Franks, the Hudson Bay trader, who was one of the founders of the town of Green Bay, Mich. His third daughter, Rachel (b. 1780), married (1803) Henry Joseph of Berthier, the founder of Canada's, merchant marine. 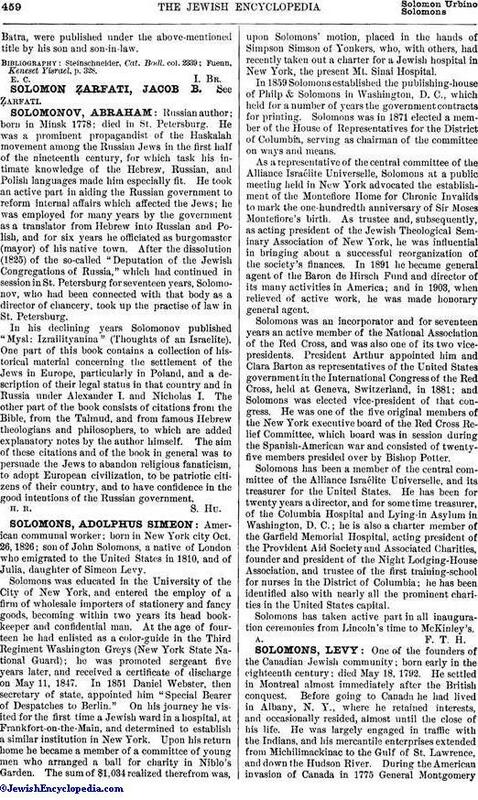 His son Benjamin Samuel Solomons (b. 1786) married a daughter of Gershom Mendes Seixas of New York. Publ. Am. Jew. Hist. Soc. Nos. 2, 4, and 10. J. C. I. de S.